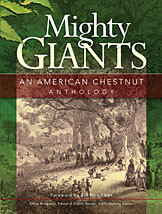 Mighty Giants: An American Chestnut Anthology is the inspiring story of an American symbol and the struggle to save it from the brink of extinction, the saga of a unique and exceptional tree that supported a way of life, that fed and sheltered our ancestors, and "touched almost every phase of our existence." From Indians and early explorers, to colonists, naturalists, loggers, industrialists, and beyond, from presidents, poets, and artists, including Jefferson, Lincoln, Carter, Thoreau, Frost, Homer, Andrew Wyeth, and many more, the story of our once mighty, towering native chestnut tree is a lesson for our times. It is ultimately a story of how people, working together, can harness the power of community, scientific knowledge, and our growing awareness of the workings of nature to make a difference. Chestnut scenes from artists such as Winslow Homer, Seneca Ernie Smith, Andrew Wyeth, Charles Burchfield, and a generous selection of seldom-seen photographs of American chestnut throughout its history. "Chestnuts in my Life" by Jimmy Carter. Poems by Wendell Berry and Robert Frost. Chestnut folklore and anecdotes, including reminiscences from southern Appalachia to New England, along with historical newspaper chronicles of the tree before, during, and after the blight. Chestnut reflections by plant geneticist and Nobel Peace Prize laureate Norman Borlaug, father of the "Green Revolution." Colorful accounts of railroads and locomotives that logged mammoth chestnut trees in Appalachia, by Les Line, longtime editor of Audubon magazine. Chestnut recollections and inspirations from Bill Owens, Dolly Parton's uncle, a Tennessee mountain man, musician, and champion of the tree. Excerpts from best-selling author Barbara Kingsolver's Prodigal Summer, about a curmudgeonly chestnut breeder and his cantankerous rural Virginia neighbor. ABOUT THE AUTHOR: Copublished with The American Chestnut Foundation, a not-for-profit organization dedicated to the re-establishment of the American chestnut tree to its natural range.